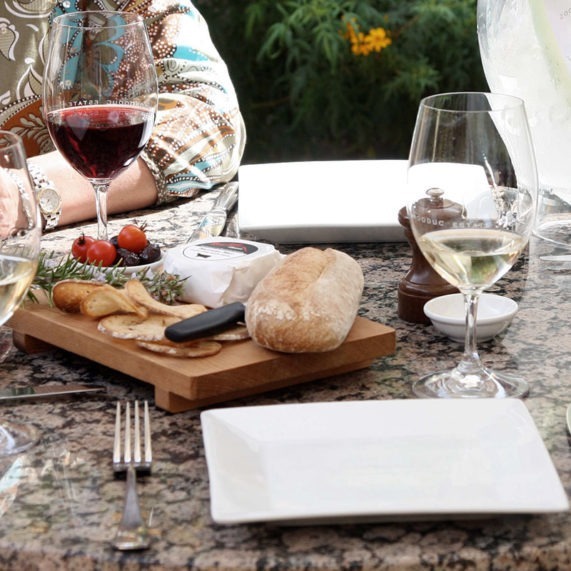 Our cellar door is simply a place to enjoy great wine. Come in for a tasting of the range, a leisurely glass or stock up the cellar. In addition, Richard bakes his sourdough bread for sale on Saturdays and Sundays. Jill offers a range of preserves and produce, also for sale at cellar door. We will continue to adhere to our local, seasonal and organic philosophy, offering Jill’s incomparable food matched to special wines at a series of Sunday lunches in the restaurant. These lunches are promoted solely through our mailing list – contact me@moorooducestate.com.au to sign up today. Each lunch will feature a set menu of food from Jill’s kitchen that is seasonal, local and where possible organic, matched to our wines. The lunches will remain at $85 a head which includes three courses and three glasses of Moorooduc Estate wine. For more information, and to book a place at any of these events, call (03) 5971 8506 or email Geoff or Lynda at me@moorooducestate.com.au. All bookings must be accompanied by payment in full. Please advise of any dietary requirements on booking. Phone number within Australia is (03) 5971 8506. Internationally +61 3 5971 8506. Cellar Door 11am-5pm 7 days a week. Closed: Christmas, Boxing Day, New Years Day and Good Friday. Please contact us for private functions enquiries.